There was a time in my life when I lived and breathed Thomas the Tank Engine. I knew all about Gordon, Henry and the Fat Controller, and could recite whole chunks of the Rev W. Awdry's tales. My memory these days is a little shaky on details, but I have to admit, I was pleased to renew my acquaintance with Thomas and Friends through Thomas' Really Useful Word Book. It's a children's board book, published by Egmont, 2008. 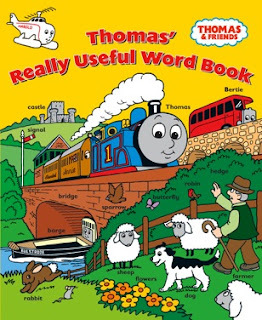 Thomas' Really Useful Word Book is sturdy and kid-friendly, with bright, colourful illustrations, faithful to the Thomas style. I like the way the book has been designed. It starts with a map of Sodor that shows all the places kids will later find on each double page spread. I can imagine chubby fingers tracing the train line around the map, or pushing a toy train along to do it for them. The next pages show Sodor's highlights, the countryside, river, beach etc. We even get to see inside the Fat Controller's house, and attend a birthday party with him! Kids love books that do double duty as a game. I believe this book qualifies. Children will enjoy finding the small images at the book edges inside the bigger illustration. They can also look for and identify Thomas' friends in the different Sodor places. Word books are great options to offer kids. Some children may not want a linear story, but prefer to identify word labels through their nearby pictures. That's great for developing decoding skills through context. Word books also work well to encourage story-telling skills in kids. Thomas' Really Useful Word Book makes an excellent prompt for discussions about the illustrations or story-starters even in the library or classroom, because the illustrations are large, clear and easy to see. My grandson who will be 2 in 3 weeks is a HUGE fan of Thomas...so I am totally immersed in Thomas e v e r y t h i n g...he has lots of books about Thomas and other trains (and many more besides that). He has loved books since he arrived on the planet. He 'reads' them daily. @PatriciaLovely that he has a literacy-loving Grandma to share his reading enjoyment!